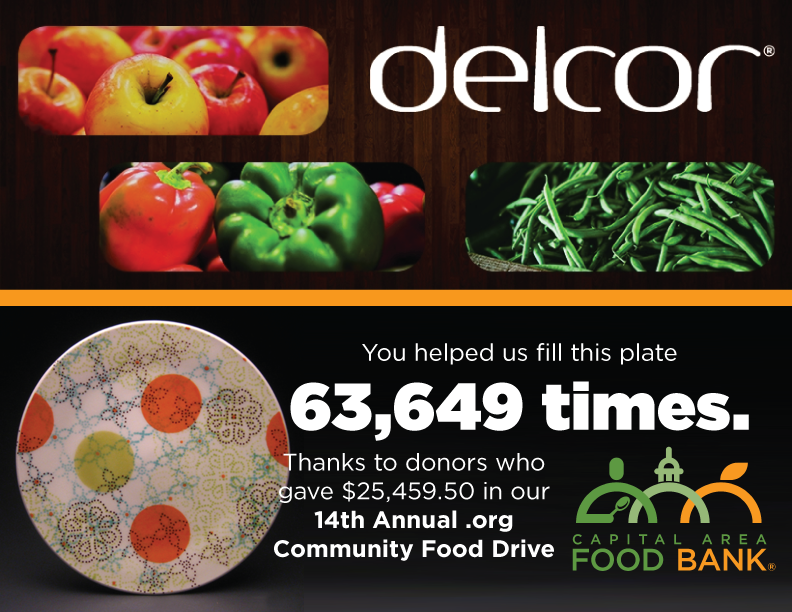 Sixteen organizations banded together over three weeks this May to raise $25,459.50 for the Capital Area Food Bank, facilitated by sponsor DelCor Technology Solutions. The money raised directly supports the food bank, allowing them to provide 63,649 meals. That’s 2.5 meals for every dollar donated. DelCor launched its .org Community Food Drive in 2003 and has sponsored the event annually, involving associations, nonprofits, and vendors within the community to demonstrate the Power of (A). Now in its fourteenth year, the goal was to raise $18,000 for the food bank. But that goal was exceeded by more than 41 percent, making it DelCor’s biggest food drive ever by 650 meals, thanks to the generosity of more than 220 individual donors. The .org Community Food Drive works by involving organizations across the Metro DC region. Each participating organization holds its own mini food drive with the direction and support of DelCor, in partnership with the food bank. Teams compete, hold fundraisers, put out jars at happy hours, and issue challenges to share the message that hunger is here. The Capital Area Food Bank serves more than half a million people across the region, where more than 700,000 residents are at risk of hunger. DelCor plans to continue educating the community about hunger in our region by sponsoring a Face Hunger event in the near future. The Face Hunger program is a real-life simulation of the tough situations and decisions food bank clients must deal with to access nutritional food and feed their families. Future events will be announced on DelCor’s Facebook page, www.facebook.com/delcortech, and will be open to participants throughout DC’s association and nonprofit community.